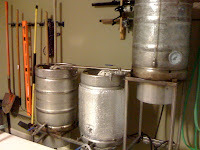 Anyone that has been homebrewing for some time has had delusions at some point of owning their own commercial brewery. But the jump from 5 gallon cornies to 10 barrel conicals is quite a gap to jump. This is where the concept of the nanobrewery was born and has been gaining legs in the American craft beer scene within the past few years. A nanobrewery is basically an extremely small-scale brewery that only distributes its beer to the local market (i.e. local bars and bottle shops). Nanobreweries, from a legal standpoint, are still commercial breweries. Therefore, they have to go through federal and state licensing processes, get approval for labels, etc. in order to distribute their products. The work it takes to get all the approvals and permits may seem daunting for such a small output, but there is also relatively little capital investment. This allows brewers to take a "see how it goes" approach and grow organically. So, what are some of the aspects of planning a nanobrewery? Lets take a look . 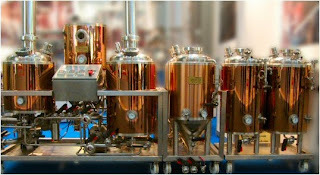 . .
Equipment - Most nanobreweries operate on homebrew-sized equipment, or perhaps something a little larger. This seems natural as many nanobreweries grow out of an extremely dedicated homebrewer’s setup. As such, the actual brewing systems are varied, ranging from converted kegs on propane burners to full brewing sculptures. Hell, Sam Calagione started bring on a 10 gallon system when he founded Dogfish Head, and look how far they have come. The most important thing to keep in mind when selecting equipment is to make it as large and automated as possible, while still fitting in the budget. The amount of time it takes to brew 10 gallons versus 20 gallons is not that different, but it provides double the beer output. Anything that can be done to make the process smoother will pay dividends in the long run, especially if demand for the beer takes off. Licenses and Permits - Given that a nanobrewery exists to sell beer, it does not qualify for the federal excise tax exemption offered to homebrewers by Section 5053(e) of the Internal Revenue Code (IRC). This means that nanobrewery owners must follow all regulations relating to brewing and must pay excise tax on the beer they produce. Additionally, any beer that is removed from the brewery for consumption must contain the government health warning statement and be properly labeled according to the provisions of the Federal Alcohol Administration Act (27 U.S.C 205). These regulations and all of the federal and state permits and paperwork can certainly be cumbersome, so aspiring nanobrewers should make sure to allot plenty of time to complete them. Distribution is probably one of the biggest legal and operational huddles a nascent nanobrewery needs to overcome in order to make it. Many states have very specific rules on how beer can be distributed and some prevent self-distribution all together (i.e. three-tier systems). Researching the specific laws and regulations for the particular market is essential. Pulling in a third-party lawyer may increase the start-ups costs, but nothing can scuttle an operation like having inventory sitting around without being able to sell it. 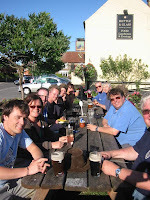 Knowing the Local Market - Most nanobreweries sell very locally. The beer is usually kegged and goes to local bars and beer stores. This requires the nanobrewery owner to market his or her own beers and usually distribute them personally. Take the time to find a half a dozen or more accounts who are interested in buying the beer. This usually involves specialty beer bars with multiple taps. There is usually an all out war for tap handle space, so the bar with four or five handles won’t give up a national brand in order to make room for a new local beer. Tap houses or beer bars with 15 or more taps, on the other hand, are always looking for something new and interesting. This type of market assessment and pre-planning can help the nanobrewer avoid all the effort to get the microbrewery going and have nowhere to sell the beer. Make sure to quantify each account's consumption rate and make sure the nanobrewer can meet the demand if it spikes. For example, if a particular bar takes a shine to the nanobrewery’s beer and starts moving it quickly, that nanobrewer better have the capacity to meet that demand, otherwise it is a missed opportunity. Gaining the power of grassroots interest behind a nanobrewery’s beer can also be important. Distributors and vendors are much more likely to give time and shelf space to a product if customers are asking for it. Small beer festivals, interactions with homebrew clubs, and cozying up to craft beer writers all have the potential to build a fan base for a good product. Further Information - The above information only scratches the surface of starting up a nanobrewery operation. Still interested in learning more? The links below are a great place to start. We’re all thinking/dreaming about doing it - if anyone out there has actually done it or is in the process of opening a nanobrewery, please let us know how it is going! Also, please let us know of any additional resources that others might find useful. sounds like Heater Allen out of McMinville might fit the bill. Even better, he introduced me to these cool 3-gallon cornies with self-contained CO2 that he used to distribute.